With NASA Not Interested, Will Tito Approach Russia, China? 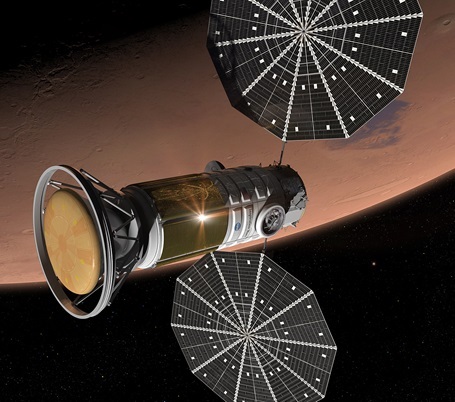 Inspiration Mars’ proposed schedule is a significant challenge due to life support systems, space radiation response, habitats, and the human psychology of being in a small spacecraft for over 500 days. The agency is willing to share technical and programmatic expertise with Inspiration Mars, but is unable to commit to sharing expenses with them. The NASA contribution would include the launch of the unmanned Mars vehicle aboard the space agency’s new Space Launch System. The person crew would be launched separately aboard a private spacecraft. Tito estimated the mission would cost about $1 billion, with $300 coming from private contributions and $700 million from the U.S. space agency. A third option would be using Chinese capabilities, he added, because the country — reportedly developing a large space station of its own — is likely “contemplating this opportunity to be the first on Mars.” Tito said he is informing Congress of his plans to go elsewhere as a “civic duty”, and that he wants to give NASA the first shot. Russia recently announced it was embarking on the development of a heavy-lift booster to rival the capabilities of the American SLS rocket. The project could involve reviving the Energia booster developed to launch the Soviet space shuttle in the 1980s. The launch vehicle flew twice before it was retired. U.S. export laws would make it very difficult for American technology to be exported to these nations to support such a mission. I think its laughable to suggest that Russia can build and test a new heavy lifter or resart Energia in that time frame. Not to say thinking the US gov would suddenly approve of the spending for this was any less laughable. IM should have titled the report ” Somewhat a voice in the wilderness.” Maybe someone would have seen the light. I don’t think he said _he’d_ go to Russia or China, but just that they were likely to go ahead with a similar plan on their own in 2021 (unless I missed something). Some of his other words at the hearing this past week. Unless that was simply a sales pitch, his motivation appears clear. I am not sure what he’ll bring to the table for the Chinese or the Russian… . It would be hypocritical of him after all that warning of China beating us there and what you cited above. His attempt to get national space agencies involved only suggest that Inspiration Mars requires some form of a national subsidy in the form of launch vehicles or existing equipment and was never meant to be a fully self funded programme. Kinda of disappointing. For the money Tito is prepared to throw into Inspiration Mars, wouldn’t it make more sense for something more modest but sustainable? E.g such as funding SpaceX’s Dragon or Bigelow’s space station? I think if you went to Congress to ask for $700m that everything that you said would need to be a sales pitch. Particularly when you desire that money to come from NASA’s budget, which is not exactly flush with spare money at the moment. NASA faces sequestration and things like that, that could eat into its budget, so it really needs to focus what it spends its money on. I’m hardly surprised by NASA’s declaration, they have enough on their plate with a dwindling budget. Going to Russia or China defeats the whole point of the mission, to inspire American’s! Russia has neither the technology or money to throw at this “adventure”. With regards China, unless it’s part of China’s “twenty year conquest of space plan” I can’t see it having any appeal to them at all. In conclusion, sadly even a 2021 Mars shot still seems a none starter. A Red Dragon mission is estimated to cost $400 million all up which would be un-manned but at least test out manned systems and gather a lot of useful data for future manned missions. I think Universe Today misinterpreted Mr. Tito’s comments. He said he believes that China or Russia could carry out a mission like what Inspiration Mars is proposing, but never indicated any interest in cooperating with them. (Indeed, he often emphasized he was proposing a “mission for America,” as the Inspiration Mars website states.) He said in the press telecon Wednesday afternoon that if he sees little progress towards even the 2021 opportunity in the next few years, he’ll probably give up, and not go to Russia or China. It’s also worth noting that, despite Tito’s statements, there’s little evidence of Chinese of Russian capability or interest to carry out an IM-like mission by 2021. He repeatedly claimed that Russia is planning to restart development of the Energia heavy-lift booster, but there’s little evidence of that; he admitted his claims are just “educated guesswork”. And China is focused through the early 2020s on development of a space station. Why Dennis? Times have changed man! America has lost the spirit – and means – to forge ahead in space ‘to go where no man has gone before’. Today the US is a poorly managed country with issues that mainly consist of pacifying ethnic minorities and ever increasing unemployment figures. Melancholy remains while longing for the golden age that once was when Kennedy gave his ‘Moon speech’. Glad to have witnessed it although I was but a child. So effectively Inspiration Mars is dead already. Pretty disappointing but hardly surprising. Considering that NASA did not manage to get the funding that they want to fund commercial crew programme, asking NASA to fund his ‘inspiration” seems a bit cheeky. As for the Red Dragon, consider me sceptical on the $400 million amount. I would double that. The reference to Energia was simply odd, and left him as an easy target for critics who question his expertise. I wonder if he had intentionally simplified his statement to reference the known Energia rather than any of the HL designs that Russia is considering. Some of those are at least Energia derived. But yes, the likelihood that Russia or China would consider such a mission seems very remote. China’s objectives, confirmed and potential are now surprisingly transparent whilst Russia’s space plans and ambitions might best still be described as “in recovery”. I am sceptical too, I would halve it. If he’s a “billionaire” and he truly believes in the inspirational value of this project, then why is he unable to pay for the whole thing?, why only a philanthropic $300million. Surely to personally fund such a voyage would be the crowning glory of any human lifetime – why is he so reticent to put his money where is mouth is?. Perhaps he wants to die rich, so that he has lots of money to spend in the afterlife !. I do not understand why he would propose such a mission, and then later show to the world, in such stark and obvious terms, his utter lack of commitment. I think you make too much of the NASA PAO response. NASA cannot make large programmatic decisions like this and Tito knows it. That’s why he was presenting to Congress. The real question now is what Congressmen will go to bat for Tito’s plan and how it gets played in the larger lobbying effort by the various contractors and NASA centers. Tito’s actual worth, before such statements? But assuming he’s worth exactly one billion, why should he put every last cent he owns into this? Name one person that does that for *anything? * It has been made very clear that this is not a financial investment. Even if it works perfectly, anyone putting their money into this, knowingly will not get their money back. Is there something to be said for dying broke? Why should one *not* enlist the support of others?